I can hardly believe that it's already the 1st of December, the holidays are upon us and the end of the year is only 30 days away! Wow, what a year! Time went by faster than I can ever remember it moving and, oh yeah, I'll be the big 50 in a few days. Now that's really something! I don't know if I'm excited or apprehensive......haven't decided yet. Actually, I've been too busy to even think about it which is probably a good thing. Don't want to be dwelling on unpleasant thoughts or things I cannot change! Anyway, I have been working on Christmas commissions trying to get those done with time to spare so I have time to enjoy the holidays as well. I have also been teaching myself to sell on Ebay and have a few items listed. My seller name is 2dogartist and my listings are under " ACEOs - animals" which stands for Art Cards Editions and Originals. These are miniature artworks done at trading card size which is 2.5" x 3.5" and they can be original paintings or reproductions. Currently, I am doing prints of my artwork as I'm not sure if painting that small wouldn't make me crazy. This is kind of an experiment for me to see if selling this way is a viable option. So far I've sold the first two I listed last week so that was exciting. This particular size seems to be good sellers on Ebay and they are very collectible. There are even websites devoted to just paintings of this size. It's a good way to get your art in front of people and very affordable for them as well. I also have placed some of my art in a local frame shop/gallery for the past few weeks. It's been quite some time since I've had my art hanging somewhere. For those readers that are local to me the shop is Art and Frame by D & J at the old Kling's store in downtown Lewiston, Id. My art will be hanging through Dec. 13th and I will be at the store from 1pm to 4pm on that day demonstrating my painting. Again, this is just another way to get my art and my name in front of people. This painting I have posted today is a commission I did for Christmas last year. The dogs name is Maira and she is a Brittany. 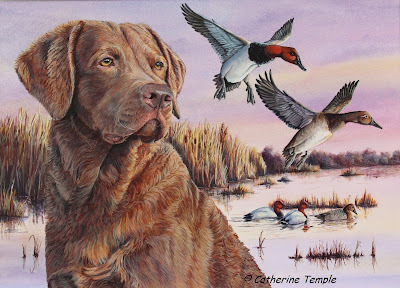 This is a hunt, point and retrieve breed. She is very much loved by her owner who shared a special story with me about their bond. When she was a puppy she was attacked and badly mauled by a coyote. It almost completely severed her front leg. Instead of amputating the leg the vet told him that he would try to save it, but that it would take a lot of physical therapy for it to ever function properly. The therapy consisted of the owner fashioning a harness for her which he then attached to a fishing pole ( a large, heavy sturgeon rod to be exact). He then placed her in the river every day and let her swim. This allowed her to work the leg without putting too much weight on it and kept her from floating away. I can just picture the strange looks this man must have got with his dog attached to a fishing pole, but the therapy worked and except for the leg bending a little funny when she points she has full use of it today. Situations like this create strong bonds between people and their pets. That's one of the reasons I love what I do so much. I get to hear stories like this all the time. I get to laugh with folks and I cry with them a lot as well when they share with me stories of special pets long gone. It's a special privilege to be included in these precious, private stories. This painting was done in colored pencil and is representative of the subject matter and direction that I'd like to take my art in as we move towards next year. I have recently purchased a large format printer so that as I complete these pieces I will be able to offer larger quality prints for sale to the general public. 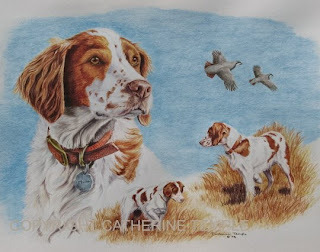 Though it may not be their dog in the picture often times they are enthusiasts of the breed and collectors of sporting breed art. Well, thanks for looking today. Enjoy this most blessed season and don't forget the reason for it, the birth of our savior Jesus! Labels: ACEO, Art and Frame by D and J, Brittany, catherine temple, Christmas, Ebay, Lewiston. Id.